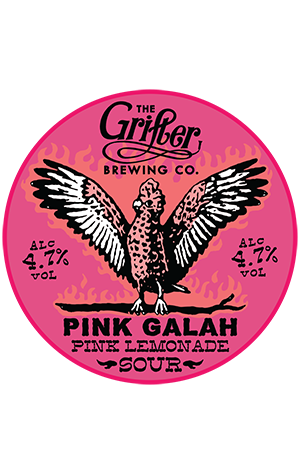 At the beginning of 2018, with the Sydney summer hitting some very high highs, Grifter released a colourful tonic for the warm weather blues in the form of a pink lemonade-inspired sour ale. Called Pink Galah, it’s the result of kettle souring followed by a secondary fermentation with whole Aussie raspberries and a squeeze of lemon juice. Much like the bird from which it takes its name, this is a beer that stands out on every front. To start with it’s a bright pink colour so looks utterly flamboyant and resplendent in the glass. There’s no less of an impression once it meets your mouth as it’s really sour, hitting the low reaches of the pH scale where puckering, refreshing and drying all entwine. But it’s also got a raging raspberry flavour that couples with the sourness to tickle your throat in a pleasant way, reminiscent of a sherbet tingle. Put that all together and it’s rather easy to see why this one off experiment proved so popular that they’ve been bringing it back to the brewery’s taps again and again while the warm weather has lingered.